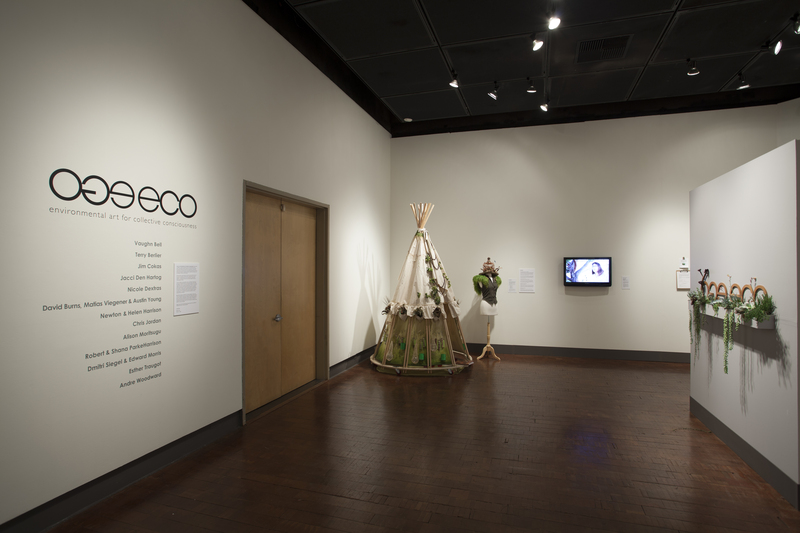 The Ego Eco, environmental art for collective consciousness exhibition was curated by Allison Town and Emily Tyler for the Begovich Gallery at California State University Fullerton, which featured to work of 13 artists. I participated on a variety of levels during my 5 week residency there. During the first 2 weeks i completed the Traveling SeedBomb dress and assembled the Urban Foragers series and staged a public intervention which was filmed and shown along side the Traveling SeedBomb dress in the gallery. The 3 Urban Foragers were at the opening reception and i was also on hand to talk about my work at the opening preview earlier in the day. During the evening, Juliana Rico made seed bombs with the public, people signed adoption paper for Vaughn Bell‘s Pocket Biospheres and i was delighted to meet artist Esther Traugot and her delicately crocheted seeds. Here is an excerpt from the Curatorial Statement. Disconnect between real actions and real-time becomes increasingly evident in our fast-paced, technologically saturated urban environments. Selected artworks in ego|eco: environmental art for collective consciousness aim to confront traditional notions of “spectatorship,” promoting involvement over complacency through the inclusion of engaged public art practices and environmental art conveying a collective call to action. Juxtapositions of mediums, content, scale, forced perspectives and changes in cadence and flow will encourage viewers to become both physically and psychologically aware of their own roles as “spectators”—symbolic of a greater need for action and social reform in the pursuit of sustainability. A 100-page catalogue including a scholarly essay by CSUF Exhibition Design alumna and founder of ecoartspace.org, Patricia Watts will be published in early 2014. See more of the exhibition HERE. Emily Tyler, Nicole Dextras, Chris Barnhill and Allison Town. Photo: Eric Stoner. Preview talk in the gallery. Photo: Eric Stoner. Watering the Mobile Garden Dress. Photo: Eric Stoner. Handing out Seed Money. Photo: Eric Stoner. The Nomadik Harvest Dress. Photo: Eric Stoner. The Mobile Garden Dress. Photo: Eric Stoner. Juliana Rico leads seed bomb making. Photo: Eric Stoner. Urban Foragers in the gallery. Photo: Eric Stoner. The Urban Foragers got together for the first time as a group to share a communal meal made from the food sources they each carry in their self sufficient dresses. The Mobile Garden Dress, aka Madame Jardin, The Nomadik Harvest Dress, aka Miss Cornucopia and the new kid on the block, The Traveling SeedBomb Dress, aka Agent SeedBomb got together at California State University Fullerton for the Ego Eco exhibition at the Begovich Gallery. The day began with the dresses walking around campus and interacting with students about sustainable food practices and also promoting the exhibiton. They then settled into the courtyard in the Visual Arts Department where they set up camp for the day. Madame Jardin and Miss Cornucopia helped Agent SeedBomb set up her teepee and then they began preparing the meal. They traded foods to enhance each others recipes and each created a dish to be shared. The Mobile Garden Dress made a salad from the veggies in her over 40 potted plants hanging from her hoop skirt and added pomegranate seeds from the NomadiK Harvest dress. The Harvest dress in turn borrowed fresh herbs from the Garden dress to add to the soup she made from the many vegetables harvested from the Fullerton Arboretum. She also made a tasty fruit salad topped with Coconut from the SeedBomb dress. As it was her first time making food, the SeedBomb dress prepare a simple dish of energy snacks by crushing nuts and seeds with a mortar and pestle and rolling them into balls. She also shared some of her fresh sprouts for the salad. After inviting friends to join them in their communal meal, they told stories while soaking their feet in the pool and then later retired, each to it’s own comfy little shelter to bed down for the night. The event was held beside Richard Turner’s “Wall Gazing Gallery”, a open structure with a corrugated roof with water falling from it into a pool surrounded by peach coloured Bougainvillea trees. The whole process was filmed and is now available to view here or click on the You Tube icon to watch in your browser. Relaxing by the pool Urban Forager style: find some public art and stick our feet in. Madam Jardin in her skirt tent, getting ready for bed. Agent SeedBomb is the name of the character who wears the Traveling SeedBomb Dress; an eco agent-provocateur with good humour and style, advocating for self-sufficiency through food independence and sustainable practices. The dress houses 50 glass vials filled with enough seed to plant over an acre of vegetables, grains and herbs to feed a family for one year, which were purchased from the Sustainable Seed Company in California. In this role, Agent SeedBomb aims to inform viewers on the identification and preservation of seeds while also engaging the community in activities such as seed bomb making and sidewalk stenciling with grains. In addition to being and avid sprout grower, he or she prepares delicious protein snacks from recipes using mostly seeds and nuts. This piece was developed for the Ego Eco exhibition at Cal State University in Fullerton California during the month of August 2013 and it was joined by its sister pieces for the first Urban Forager communal meal. 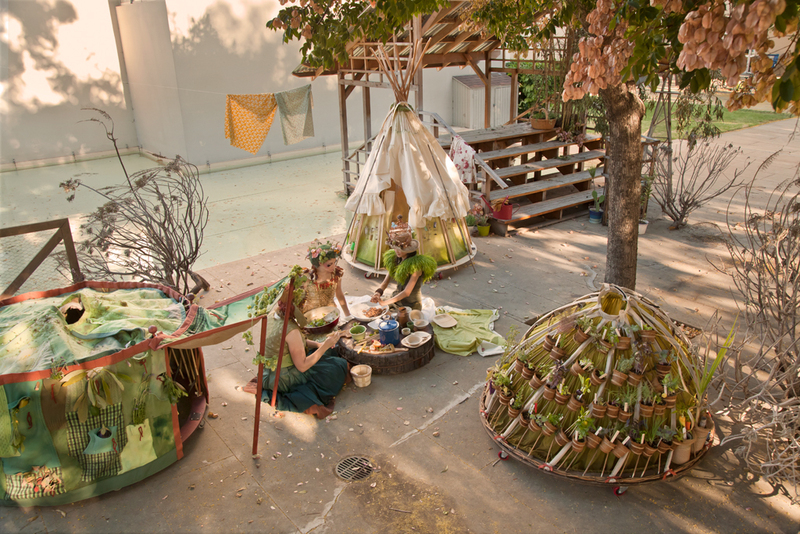 The Foragers set up camp beside Richard Turner’s “Wall Gazing Gallery”, an environmental sculpture reminiscent of Asian shrines found along country roads and they prepared dishes with produce supplied by the adjacent Fullerton Arboretum. The dress was then installed in the Begovich Gallery for the duration of the exhibition. On opening night Agent SeedBomb, played by Alice Tokunaga gave out Seed Money (seed embedded paper coins by Leafcutter Designs) to the public. I love their thoughtful designs and was very happy to incorporate it into the project. This dress is made for traveling and throwing seed bombs. Hand washing in a clay bowl. 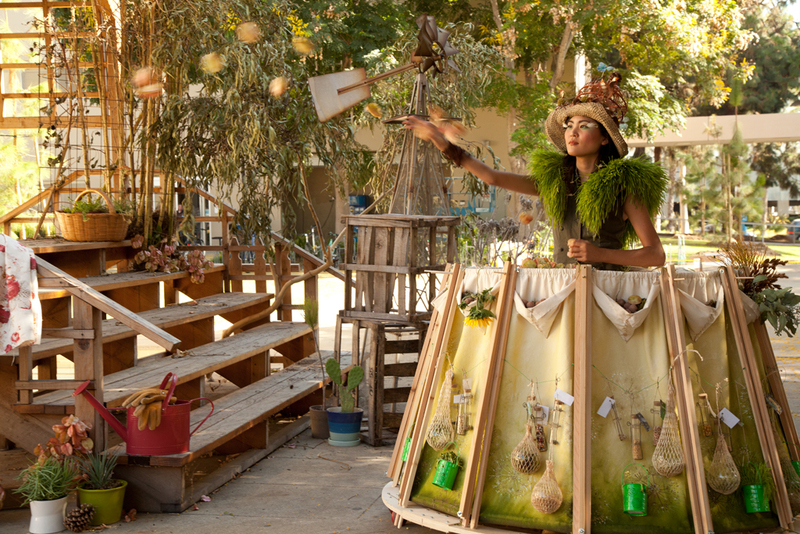 The Traveling SeedBomb Dress is the third instalment in the Urban Foragers series. 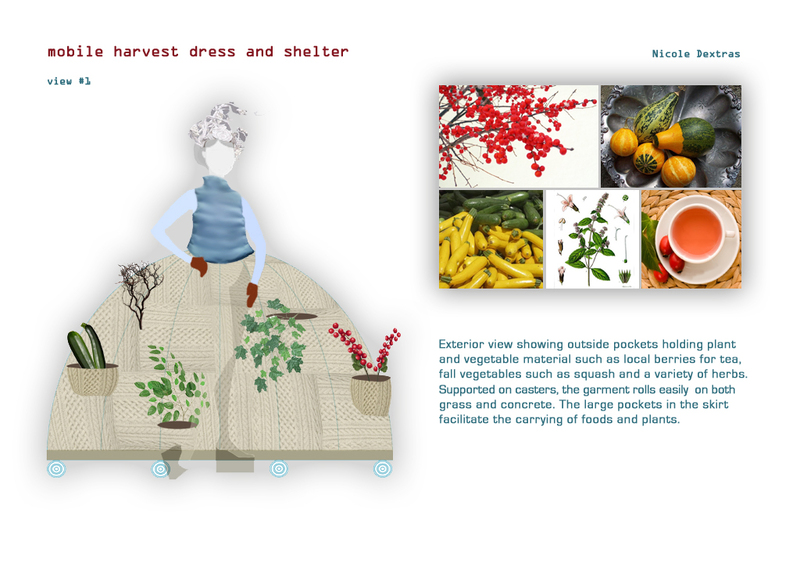 Like its predecessors, the Mobile Garden Dress and the Nomadik Harvest Dress, it functions as a garment, a shelter and a food source. 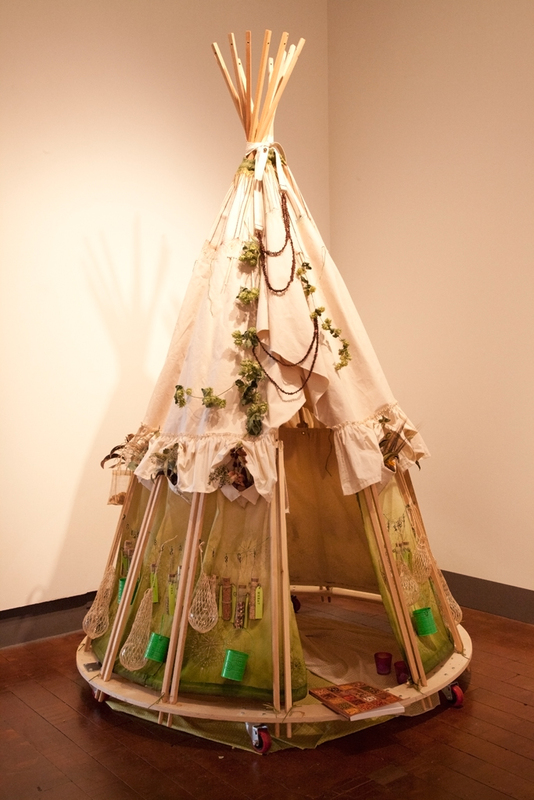 As this series is about self-sufficiency, each new piece refers to a nomadic structure and for this one i chose the teepee because the shape resembles a Pine cone. I am fascinated by the ingenious ways that plants propagate their seeds and so i have tried to incorporate this into the design as much as possible. There are cone shaped pockets all around the edge, which hold seed bombs, which were placed within easy reach of the wearer so they could be thrown while moving about. The structure is based on a series of hinged cedar pieces, which when folded down make up the skirt and when extended they form the teepee shape. I have used metal bolts and wing nuts as a means to hinge and tighten the segments. My intent is to someday replace these with a more organic material but for now they at least only require a small screwdriver to assemble. The skirt is covered in heavy duct canvas hand painted with a dandelion motif, a symbol of highly effective plant survival and endurance. Our agent of propagation also wears a secondhand vest adorned with épaulettes of fresh Wheat Grass and a hat formed from a bamboo birdcage with birdseed. I looked at many options for displaying the seeds and finally decided on the glass vial because I want the public to be able to see the seeds clearly so they can learn to identify them. I created a wire cage for each one, 50 in all and hung them between the struts with linen thread. I also attached some glass globes and green cans, which have holes in them to facilitate the daily rinsing of seeds for sprouting. 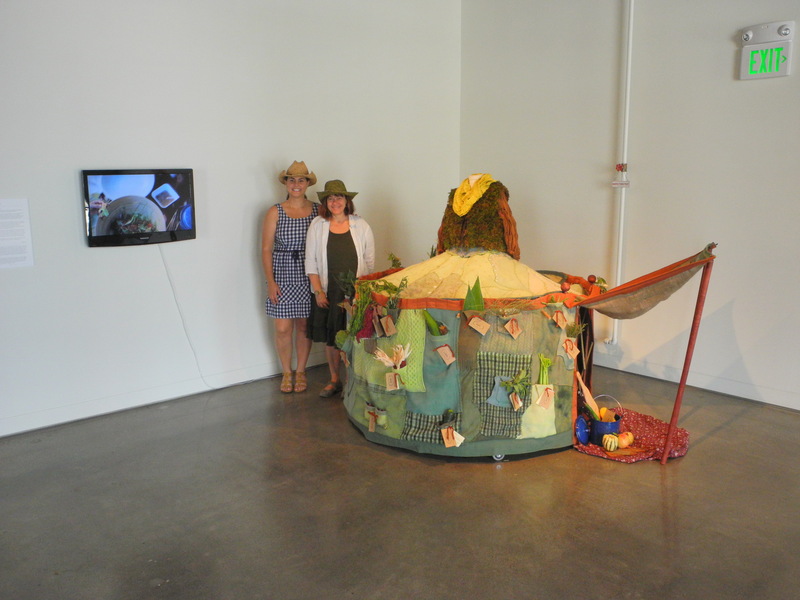 I was invited by curator Emily Tyler to participate in the Orange County Great Park’s OC3 challenge exhibition with the installation of the Nomadik Harvest Dress. The theme for OC3 2013 is Sun Soil City was to inspire discussion relating to important topics of energy, agriculture, and community. Fourteen curators from prestigious Orange County institutions have been invited to transform a designated space in the Great Park Gallery. The challenge was simple — create a unique environment within the allotted space showcasing the work of one artist utilizing recycled or reused materials. The website also has short videos of all the curator/artist teams. Yes the Loofa you scrub with comes from a plant! Purslane is an edible common weed. Cholla Cactus buds, one of the NHD’s favourites! Prickly Pears in their pockets! Emily and Aaron in the Orange Hot Air Ballon. I stayed on the ground and rested in the shade! Fashionality is a new exhibition curated by Julia Pine at the McMichael Canadian Art Collection Gallery in Kleinburg Ontario. This exhibit features 23 Canadian artists who work with the theme of the garment. The show runs from May 5th to September 03, 2012 and the opening reception is on Sunday May 13. I will be showing photos of my IceShifts and my Weedrobes series, plus a new video on my work. I will also be doing an art residency at the McMichael from June 17th to July 1st. There i will create a new dress/tent called the Nomadik Harvest Dress which will culminate in a performance in the gallery and in the park. The gallery houses the largest collection of paintings by the Group of Seven, the iconic Canadian landscape painters and it is said that some of them are even buried in the park, so it is a great privilege for me to create there. The artists are: KC Adams, Ingrid Bachmann, Lori Blondeau, Dana Claxton, Cathy Daley, Nicole Dextras, Aganetha Dyck, Jane Eccles, Gathie Falk, Farheen Haq, Barb Hunt, Michele Karch-Ackerman, Meryl McMaster, Kent Monkman, Janet Morton, Jacques Payette, Camal Pirbhai, Barbara Pratt, Ana Rewakowicz, Natalie Purschwitz, Jana Sterbak, Camille Turner, and Mary Sui Yee Wong. “Together, the assorted practical and conceptual approaches of these artists speak the common language of dress and, in the process, help to define just what it is that Canadian fashionality might be.” Julia Pine.